The perfect side dish for late summer ~ early fall. 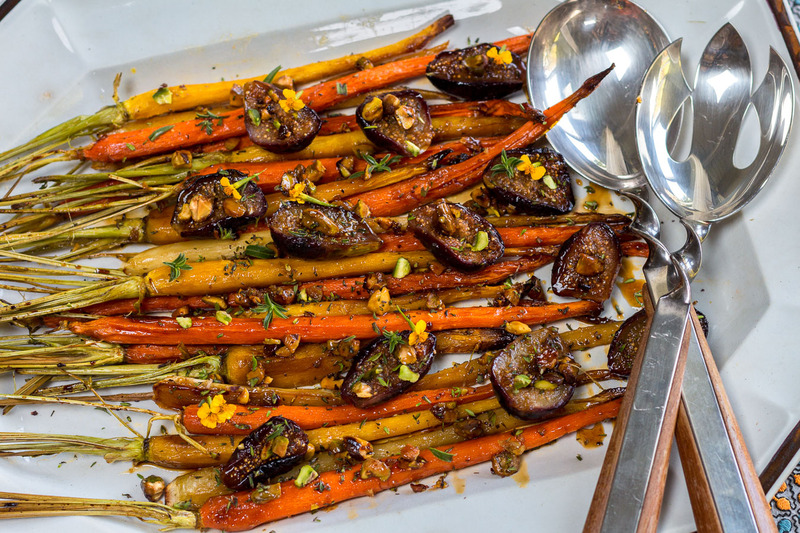 Carrots caramelize with the figs with a delectable just-sweet-enough glaze… all roasted in one pan. A Vegan recipe. Here is a colorful, balanced side-dish that excites the palate rather than weigh it down. The perfect combination of roasted veggies & fruits with nuts, herbs and a zippy (well….zesty!) glaze. Lightly peel the carrots. Cut stems to 3 inch lengths. Wash and dry well. Place the carrots in a rimmed baking tray. Add 1 T. olive oil, salt and pepper. Mix in well. Roast in the oven for 15 minutes, or until just turning golden and caramelizing underneath. Turn over with tongs. Mix together in a small glass dish; Pomegranate Syrup, Honey, Coconut Oil, Cinnamon and Garlic. Place in a microwave for 15 seconds to blend and liquify. Move carrots over slightly – add 1 teaspoon of the olive oil to a side of the pan – add the figs, cut side down. 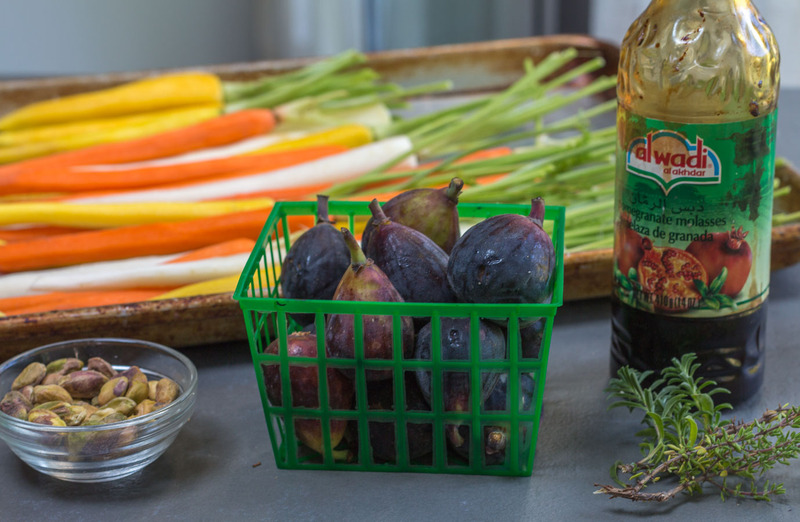 Brush all but 1 tablespoon of the glaze over the carrots and figs. 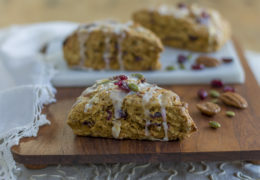 Scatter with pistachios. Roast for 10 minutes until the figs and carrots are all glazed and tender. Remove from the oven and scatter with the fresh herbs and the remaining tablespoon of the glaze and serve. Can be made a day ahead. Add a drizzle of water, and cover with tin foil until just heated through. *I have used organic orange, yellow and white carrots. See BLOG for more photos and information. Similar flavors to Tzimmes; often part of the Rosh Hashanah meal, when it is traditional to eat sweet and honey-flavored dishes. AMAZING recipe.. we are making this for a dinner party now and your recipe is really inspiring us to get creative!